In 1986 MC Keithy E (now known as GURU) completed a demo tape that featured the early members of GangStarr; John Johnson (formerly known as Beatmaster Jay), DJ Mikey Dee and Damo D (Beat Box). The tape that was recorded at “Radio One” studios in Boston, includes multiple racks featuring the young Guru rhyming and displaying his singing voice over a bare drum machine. The demo tape was clearly made and sent directly to Magnus Johnstone (a local DJ/Radio Host in Guru’s hometown of Boston) for his show. Both the demo tape’s cover and the actual tape are labeled “for Magnus”. Magnus Johnstone founded Lecco’s Lemma radio show in 1985. It was a groundbreaking hip-hop radio show, the first of its kind in Boston and one of the only rap radio shows in the world at that time. What made it even more revolutionary for the emerging Boston hip-hop scene was that Magnus encouraged local rap groups to come down to the station and perform on the air. Since the show was Boston’s outlet for up and coming hip hop artists, it was a big deal to appear on the show. This demo tape earned MC Keithy E and crew the right to be on the show and share their talents to the listeners. With this amazing print from 1986 by the hands of GURU, we introduce the 1st commemorative shirt for THE X LABEL. In 1986 MC Keithy E (now known as GURU) completed a demo tape that featured the early members of GangStarr; DJ Mikey Dee and Damo D (Beat Box). The tape that was recorded at “Radio One” studios in Boston, includes multiple racks featuring the young Guru rhyming and displaying his singing voice over a bare drum machine. The demo tape was clearly made and sent directly to Magnus Johnstone (a local DJ/Radio Host in Guru’s hometown of Boston) for his show. Both the demo tape’s cover and the actual tape are labeled “for Magnus”. Magnus Johnstone founded Lecco’s Lemma radio show in 1985. It was a groundbreaking hip-hop radio show, the first of its kind in Boston and one of the only rap radio shows in the world at that time. What made it even more revolutionary for the emerging Boston hip-hop scene was that Magnus encouraged local rap groups to come down to the station and perform on the air. Since the show was Boston’s outlet for up and coming hip hop artists, it was a big deal to appear on the show. This demo tape earned MC Keithy E and crew the right to be on the show and share their talents to the listeners. With this amazing print from 1986 by the hands of GURU, THE X LABEL brings to you THE KEITHY E DEMO HOODIE. * The hoodie is American Apparel. Sizes are unisex (We recommend for women to order one size smaller then their normal size). The X Label brings to you the Jazzmatazz Loungin T-shirt! This artwork beautifly combines the album cover of Guru’s Jazzmatazz Vol 1. and the song “Loungin.” “Loungin” is a single from the Jazzmatazz Vol 1. album featuring the gifted trumpeter Donald Byrd. *Comes in Black. In 1993 Guru released Jazzmatazz Vol. 1. Guru decided to take music to new heights by utilizing the brilliance of actual jazz musicians to produce the sounds to rhyme too. He merges his potent and forever meaningfull rhymes with beats and instruments directly from authentic lounge jazz. The album fuses an assortment of jazz talents both old and new, including Donald Byrd, Lonnie Liston, Roy Ayers, Courtney Pine, Branford Marsalis , and Ronny Jordan. He used the melodic voices of Carleen Anderson and N’Dea Davenport and collaborated with french rapper MC Solaar. The variety of guest artists adds diversity and originality to each track, and gives the album a distinct jazz feel. In its own right the album is a historical document of jazz and hip-hop starting to blend. The X Label brings to you… The GURU SIGNATURE t-shirt. This shirt consist of Guru’s actual handwritten signature. Below the signature is the legendary meaning behind the name. The X Label brings to you “Rhymes”!!! The X Label brings to you the “Robin Hood Theory” t-shirt. The shirt displays a rare image of a young Guru looking very studious and ready to take on the world. 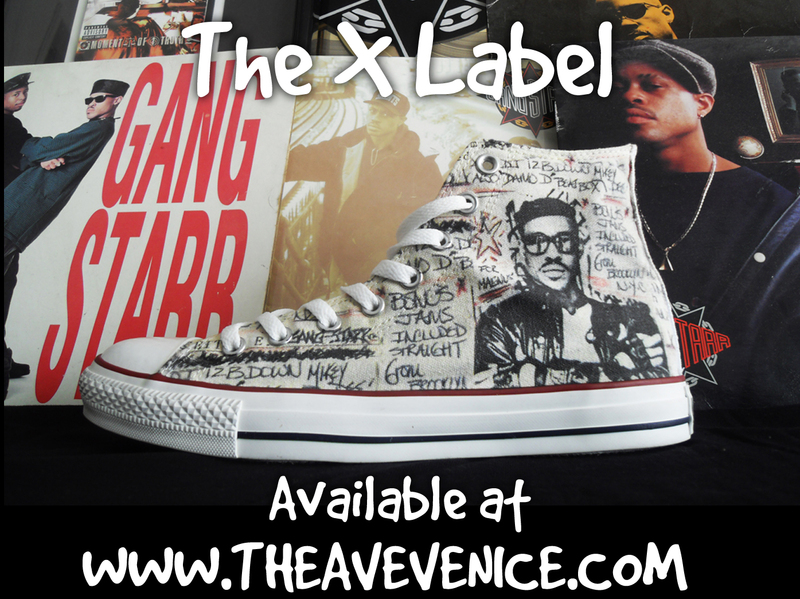 Making a beat for the greatest voice in Hip Hop can be some pretty big shoes to fill. When Guru first heard DJ Lord Ron’s raw production style on the boards, he knew that they had to get in the studio together. DJ Lord Ron has been getting busy on his MPC-60 since the early 90′s with production credits for artists like C Rayz Walz, Krumbsnatcha and Group Home. In 2003, Guru linked up with Lord Ron and recorded a few joints. ”Propaganda” was one of the tracks that came out of those sessions. The songs they recorded were independently released but still slipped under the radar. In honor of Guru, these lost gems have been resurrected on a classic format: the cassingle. Support and get your Guru “Propaganda” t-shirt today! 25 copies will be bundled with a Limited Edition “Propaganda” Poster. The “Propaganda” poster will also be available separately. A portion of the proceeds will be donated to the Elam Family. The X Label brings to you the “DON GURIZZY” T-shirt! The name, Don Gurizzy was one of Guru’s many AKA’s. On this day April 19th, the 2nd anniversary of Guru’s passing, we make available a t-shirt from the mural created last year at his alma mater Morehouse. The mural was created in honor of Guru’s 1st year anniversary of his passing. On April 20th, 2011 the Morehouse Office of Housing and Residential Life, Residence Hall Association, and Society Mag presented the 2nd Annual Renaissance Arts Festival. During the Arts Festival there was a live painting tribute to an esteemed Morehouse alum and hip hop legend Keith “Guru” Elam ’83 who passed away on April 19th, 2010. The painting was done by Jordan Jackson founder (Morehouse student at the time of the painting) and owner of Original State of Mind, LLC originalstateofmindllc.com. The X Label and Jordan Jackson bring to you a limited edition t-shirt of the mural. The shirt features the mural on the front and the word Knowledge. The back of the shirt displays a quote by Guru, “Knowledge is wisdom, understanding truth’s the proof.” The shirt comes in both black & white colors. Get yours now…. Inspired by the Andy Warhol theme, The X Label brings to you “Guru Warhol.” The image comes from the actual cover of the CD on Guru’s Jazzmatazz Streetsoul Vol.3. This t-shirt is strictly for the real GURU hip hop heads! In 1995 Guru released, Guru Presents Ill Kid Records, his first solo album outside of the Jazzmatazz series. The album consist of various artists such as Jeru, M.O.P, Group Home, Bahamadia, and Big Shug. Guru flexed the other side of his musical talents producing the majority of songs on the album. A rare gem of an album, this t-shirt showcases the artwork created by Guru displayed on the cover. The name ILL KID was also what Guru liked to call his alter-ego, his wild and untamed side (hence the deranged looking figure). Take home a piece of GURU history and if you’ve yet to listen to the album make it a priority! This t-shirt was inspired from the song “Guidance” on Guru’s Jazzmatazz, Vol. 3: Streetsoul album. Guru dedicates this song to his son (KC). The quote, “Walk your own walk and keep your head to the sky” is a piece from the song. This amazing image of a young Keith Elam (Guru) speaks for itself. The image and quote from “Guidance” are analogous as in essence Guru is speaking to a younger version of himself.